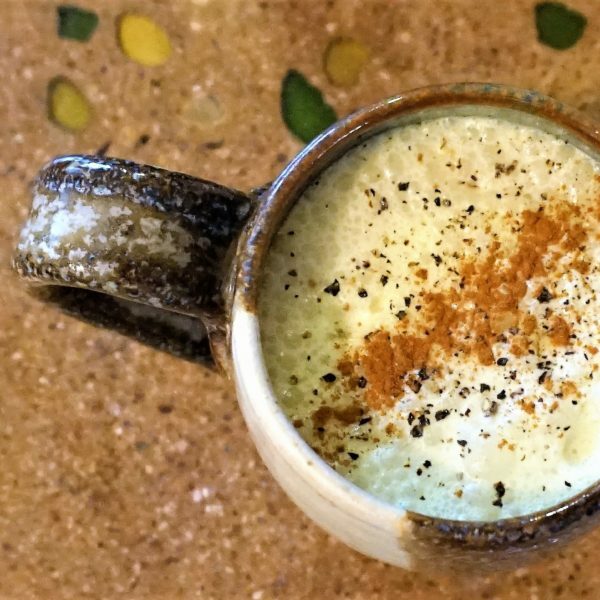 I goofed off with some different ways to make turmeric milk and came up with this simple and delicious drink. It’s versatile to fit all seasons – you can warm it for cooler weather or throw some ice in it on hotter days. The black pepper helps with absorption of the curcumin (found in turmeric). If you have access to local raw honey, go for that option. If you prefer a different sweetener, go for that instead, of course. 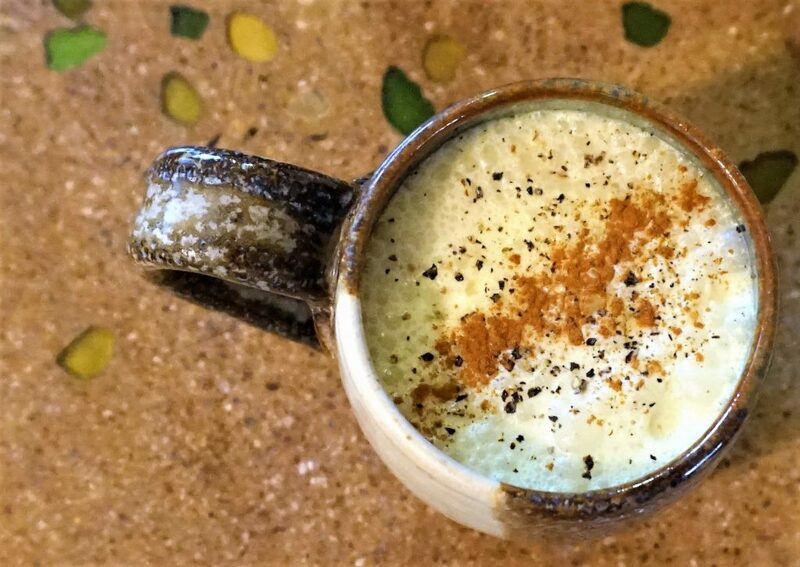 Combine the milks, turmeric and ginger in a blender. Blend until the turmeric and ginger are finely chopped. Let this mixture sit for 15 to 20 minutes to let the milks absorb the turmeric and ginger goodness. The milk should be a beautiful light orange color after this amount of time. Strain the milk into a bowl (you can reserve the solids for another use or compost them). Rinse the remaining solids out of the blender. 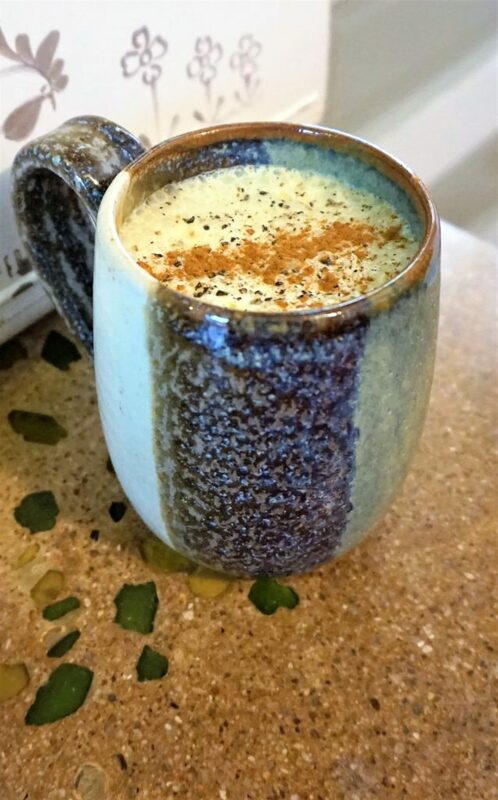 Return the milk mixture to the blender with the honey, cinnamon, cardamom, nutmeg and black pepper. Blend to combine and pour into a mug or glass. You can drink this cold or warmed up a little bit. Sprinkle a bit more cinnamon and black pepper on the top. Turmeric Tip: I suggest wearing gloves when cutting this. The beautiful color will stick to your hands and everything you touch for the next 3 days will turn orange. Before heading to bed, put 1 cup of almonds in a bowl, pour filtered water over them until they are submerged. Place a cover over the bowl and let soak for about 8 hours. Drain and rinse the almonds in a colander. At this point, you can definitely make almond milk, however, I will let mine set in the colander over the sink for another 6 to 8 hours to fully drain and continue sprouting. Place the almonds in a bender (preferably high powered, but the not-so-high powered blenders also work well) with as much of the 4 cups of water you can fit in with the almonds (I usually can fit 3 cups in). Blend on high. Depending on your blender, this could take anywhere from 1 minute (high powered) to 3 minutes (not-so-high powered). This may take some trial and error, just depending on the individual blender. You are looking for the soaked almonds to be pulverized in the water, but not so pulverized that the pieces slip through the strainer into the milk. Take a nut milk bag (I actually use a jelly strainer – has a tighter weave than a nut milk bag) and pour the milk through that into a large bowl or pitcher. Squeeze the bag (I twist the top of the bag so the pulp doesn’t squish out the top) until you get all of the milk out of the pulverized nuts. The result will be a beautiful creamy milk. If you strained into a bowl, pour into a pitcher. If there is water remaining from the 3.5 to 4 cups, add that to the pitcher and stir to combine. The milk should last 3 to 5 days in the fridge. You will have leftover pulp from the almonds in the strainer bag – there are some recipes out ‘there’ that incorporate the pulp, or you could compost it. I usually feed mine to our chickens – they LOVE it. OUR STORIES | anti-inflammatory, anxiety, depression, Foodie Friday, health food, Healthy Eats, mental health, milk, mindfulness, Recipe, stress, turmeric | January 25, 2019 .